Fully Articulated Body: More than 30 points of articulation allow the figure to be displayed in multiple dynamic poses. Approximately 31 cm tall. Realistic Portrait: Lovingly rendered by a top artist, this is a perfect likeness of Jensen Ackles as Dean. Each head sculpt is specially hand-painted. Costume: Dean has his hand-weathered jeans, black T-shirt, maroon overshirt and jacket. Boots: Made of leather-like material and sporting actual laces, these sturdy boots are Dean’s typical footwear. Presentation: Supernatural display base features the anti-possession symbol. Pistol: The ivory-handled Colt M1911A1. Purgatory Blade: Made from stone and bone, the blade Dean used when trapped in Purgatory. Duffle Bag: Every hunter needs something to hold all his weapons. Watch: Set to killing time. 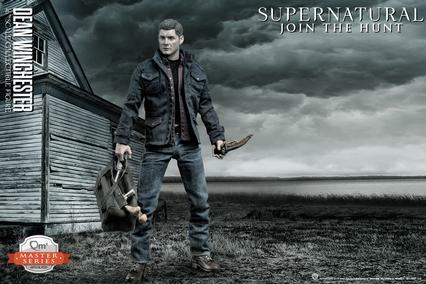 This fine collectible figure brings Dean Winchester to life and is the first in the line of 1:6 scale Supernaturalfigures coming from Quantum Mechanix Inc.